Recently I was interviewed by the amazing Pastor Mel on his Joshua Generation Radio show and got to share my story and how grateful I am for what I have achieved today. If you know any of my story, you know that just six years ago my wife and I were in a very bad place. We had losses. Then my wife became ill in her pregnancy and I was forced to make a choice. Work my 9-to-5 Monday through Friday J-O-B or be at my wife’s bedside to help her and be there for her. I chose the latter and had to find a new way to earn money. We had mouths to feed and bills to pay, so I started selling big time on eBay. That was okay, but didn’t work well, especially after I injured myself while playing volleyball. In fact, I landed on another player after spiking a ball and punctured my lung. At that point, my wife and I were both bed-bound and unable to work. No one was bringing in an income. Our home was foreclosed and we squatted. Things went on that way for a while. Slowly I got to where I could walk without great pain. About that time, a friend suggested I become a real estate investor. He had suggested it before. Now I was listening. I was out of choices. I had to do something. I took one week of very intensive training and put what I learned to immediate use. I haven’t stopped since. I am grateful to my friend for being persistent with suggesting real estate investing, and I am grateful to God for giving me the strength to keep going even in the face of adversities. My message in this interview with Pastor Mel is that we have to put ourselves in a position to be open to making the changes to have a better life. I did it; you can do it, too. Wherever you are now, you can start taking steps. Start from where you are right now! For me, it’s real estate investing. For you, maybe it’s something different, but I guarantee that if you don’t DO SOMETHING you’ll be exactly where you are today, tomorrow, next week, etc. It is my mission to share with others what I know about real estate investing. 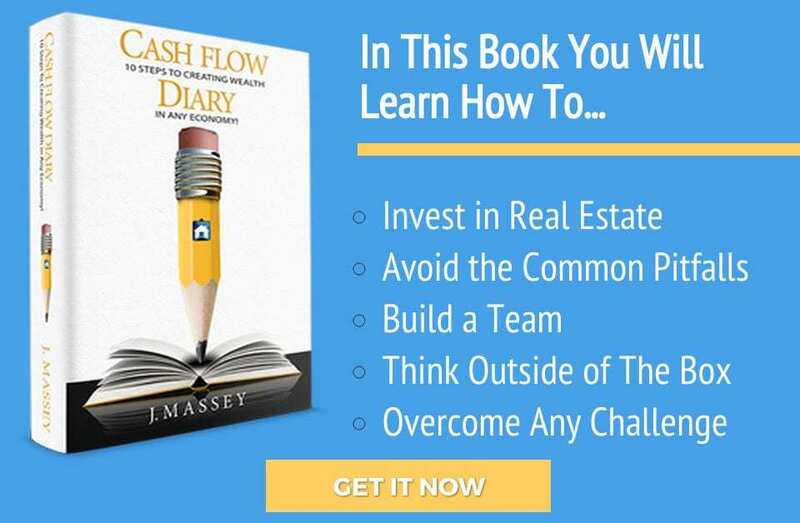 That’s what the Cash Flow Diary site and podcasts came from, and that’s why I wrote my forthcoming book. That’s why I do coaching. That’s why I do weekly live Deal Reviews. A lot of what I do costs you nothing. So why not take advantage and learn? Maybe you’ll be great as a real estate investor! What happens when you start doing well as an investor? I promise that first it feels great. Second, you have to ready, because every item or thing or goal you want and then you attain brings with it more and more responsibility. Today, I don’t just have to feed my family; rather I have a team of people who help me, and I’m responsible to make sure their lives are improved. I’m responsible to those I instruct and coach, too. I run workshops and webinars. To do this and to help more people faster, I have to get beyond myself and get a handle on my fears and insecurities. With God’s help, I do it, too. I use my gifts to make things happen. Every day I pray for strength and guidance. It works! I love helping people learn new things. I get a thrill when someone comes to me who needs help with his or her deals because they aren’t quite sure what to do. That’s when I feel my true joy! I get to empower others to change their lives, stand on their own two feet, take control of their financial futures, and then help others do what they have done. What can be better than that? For me, nothing. And I’m just getting started. My team and I are developing so many new products and services that there aren’t enough hours in a day! Keep checking back, put yourself on our lists to receive information. Take action. In closing, I really enjoyed being interviewed by Pastor Mel, because I got to share with his listening audience my journey, my legacy plan, why I even got into real estate investing in the first place, my struggles, my challenges and what I had to change inside my mind to allow so many wonderful things to happen not just in my life but in the lives of those I’m helping. I feel amazingly blessed. Listen to this special interview and support the amazing Pastor Mel’s Joshua Generation Radio show. I promise you will learn a lot! CFD 060 – Dr. Joey Faucette is a Positively Powered Up Guest! CFD 061- Melanie Strick Says Your Money DNA Forms the Building Blocks of Sustainable Financial Life.